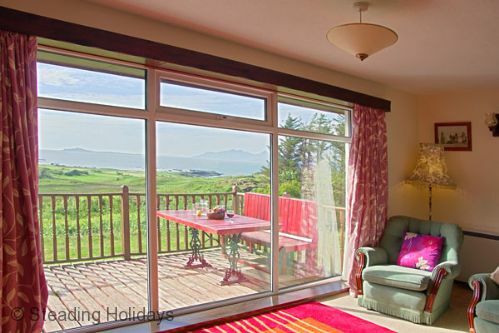 A comfortable bungalow on the quiet, north coast of Ardnamurchan, with spectacular views, through the large French windows, across to the Small Isles. Spend evenings enjoying a drink on the large decking area while watching the sun set over Eigg, Muck and Rhum. The lovely sandy beaches of Kilmory are just a short walk away and all the amenities of the pretty village of Kilchoan, are just five miles to the south. Perhaps a little isolated for a stay at this time of year,especially with the weather,but bungalow was nice and warm,there is a good chance i may come again next year. Excellent service through Sanna Spice and the house manager to help provide access for an Indian take away to the house. Fantastic location with views in all directions and lovely sunsets seen from the decking which was a great place to sit. Better than expected. Home made bread and lovely fresh vegetables an unexpected bonus! Beautiful area. Great property in stunning location. Lack of phone signal or wireless internet a real blessing allowing total escape from the world. Local shop not very well stocked so bringing food essential. Hotel and cafe excellent however. Lovely cottage, very clean, warm and comfortable with the most amazing view. .
Lovely cottage, very clean, warm and comfortable with the most amazing view. I would definitely stay again. The cottage was well laid out and very homely and welcoming but could do with heating in the hallway. Most of the cafes etc were closed but the local shop was well stocked and the staff helpful. Excellent location for bird and wildlife watching. A bit of a bumpy ride to the property and the beach is a bit of a walk but all in all worth the effort. Very clean and cosy. A fantastic place to spend a week with unbelievable ever changing views across the sea to the islands. Fantastic sunsets and only a short walk to the beach in a very well equipoed cottage which is central to many beautiful places to visit and explore including a day trip to Tobermory on the Isle of Mull which is only 35 minutes away by ferry. 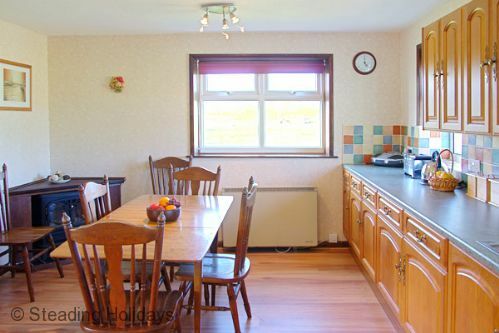 The cottage is spacious and homely with a large, safe enclosed and gated garden and driveway. Golden eagles flew above and around the cottage as did the clouds when it rained! You will certainly feel relaxed after time spent at Ceol na Mara which speaks for itself - the sound of the sea. Very good. Local shop in Kilchoan extremely well stocked as well as friendly staff. Also used community cafe in Kilchoan often, after walks and days out. Ceol na Mara - house generally excellent but a couple of minor drawbacks. Cleanliness of the house was excellent and it is well-appointed but you only score "good" due to the dog poo in the garden. There was a friendly enough dog, presumably belonging to a neighbour, who visited frequently. Location is excellent with wonderful views and easy access to the hill behind but the problem is the steep, rutted and pot-holed one-third of a mile access track which made us reluctant to take the car in and out more than absolutely necessary. Hence you only score a "good". We made good use of the pedestrian short-cut to the road through the garden. Notwithstanding the above comments, this was our third visit to the house and we'd come again. Yes but no details at this stage. Adequate and as expected having been to Ardnamurchan many times before. The community garden is a useful resource but due to the remoteness of Ardnamurchan it is wise to take provisions. The house commands a wonderful view but access is awkward. The steep track is unavoidable but the potholes at the top could be attended to. The grass might have been shorter. This is perhaps our 11th visit to the area. The local facilities are just as we expect them, with usually a little improvement each time. We had a lovely stay. The cottage is in a beautiful location and the sunsets are stunning. The cottage is well equipped with everything needed. The utility area was very handy and nice to have for muddy boots etc. Lovely local walks to the beach. One word of warning: Ardnanurchan is very isolated. No phone signal, or 3G. The shops when we were there had limited opening. And not brilliantly stocked (understandably) so just make sure you arrive with provisions. However, the community garden bag of veg we ordered was fantastic; a real treat. Would definitely come back. Thanks. Fantastic views & Wonderful Birds!!! Excellent week spent admiring the views across to the Isles. Truly mystical. We were entertained by aerial gymnastics from both Sea Eagle & Golden Eagle, whilst serenaded by songbirds. An ideal property for adults but would advise not suitable for Todlers/Young children due to a narrow 'Burn' (stream/brook) running along the edge & within the property. Would likewise advise that the wonderful outside full length balcony/verandah's decking becomes slippery when damp after rainfall. But these two minor 'cautionaries' do not and certainly did not spoil an idyllic week's holiday for us and our 6 & 14 year old dogs. Ceol Na Mara is a 'Treasure' for those who love the peace & quiet with panoramic views and memorable sunsets. Finally, John at Steading Holidays is an inspiration for his love of the area with a wealth of local knowledge. A visit to John & Jacqui's Kilchoan Crafts & Gallery is a must with your 'pennies' during your stay! Had a fabulous break away from it all in this wonderful location. Small shop within a short drive as well as ferry across to Mull. Excellent food and hospitality at The Sonachan as well as Fish Supper on Fridays at Kilchoan Hotel. We are sorry that the pine martens impacted on your stay. The wildlife in the area is amazing to watch but not to share a house with. I am pleased to say that they have since moved to a more suitable home amongst the trees. We hope you will visit the area again in the future. 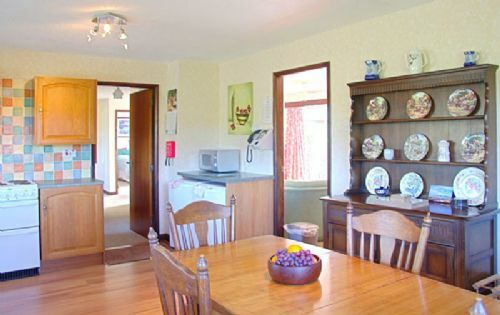 Ceol na Mara is an excellent place to stay and explore the surrounding area from. It's a short (15 minute) drive to Kilchoan where the shop and bar are found, but the house itself is surrounded by moorland and grasslands rich in wildlife. A short walk will take you to the sea where sandy beaches and rocky shore can be explored and seabirds watched. The house itself is comfortable and pretty well appointed. The most impressive feature being the large floor to ceiling windows in the living room which afford spectacular views towards the sea and several of the inner isles. It is easy just to sit and watch the weather unfolding in front of you and you may be treated to a glorious sunset at the end of the (long) day. The drive to the house is a little rough, but we only have a bog standard VW Golf and had no troubles getting in and out. We spent a very pleasant week here and can happily recommend it to someone wanting a quiet location set within impressive landscape and abundant and varied wildlife. Kilchoan had a shop and bar that provided all we needed. Ardnamurchan isn't exactly 'facility rich' , but that's not what you go there for - it's the view, the walking, the coast and the wildlife - in that sense it's as good as anywhere in Scotland. The cottage has all the basics covered but what really makes it is the view from the balcony at the back, we were fortunate with the weather and were able to sit outside a few times to enjoy the surrounding views. The fire in the living helped to set the mood in the evenings and complemented the glass of wine perfectly. It's also great for the dog too with the long grass at the back he loved playing around in it. Will properly go back again. Stunning location with amazing views. Highly recommended. The house is in an area of outstanding beauty and has a breathtaking view, short walk to the beach, good driving distance to the shop, watching the golden eagle from the terrace. We had a great week with rain on only two days but even that did not stop us going for walks. The peace, quiet and gentle pace of life in Kilmory is one of life's treasures. A lovely location with fantastic views from the property. The house is a good size and very comfortable for our party of six. Beautiful sunsets and the best beach ever within a short drive. Easy day trips to Mull although a little pricy if you want to take a car. Would recommend.